Visit the MyUNOH Portal to view your financial aid award letter. You will receive an email notification to your UNOH email account and a postcard informing you to visit my.unoh.edu to access your Financial Aid Award Letter. You can log into the MyUNOH Portal using your UNOH e-mail address (you@unoh.edu) and password. You can reset your password at http://support.unoh.edu. 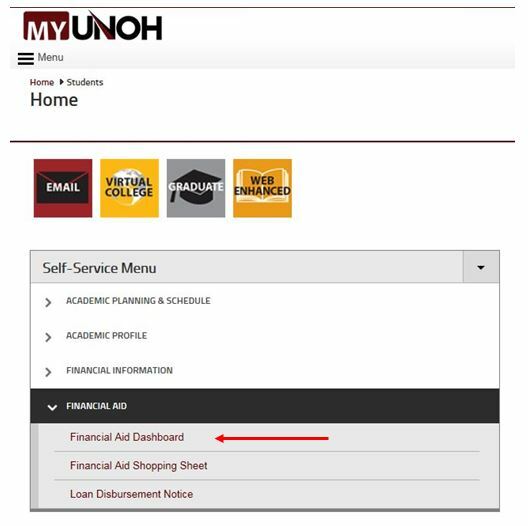 Once you are logged into MyUNOH, click on the 'Financial Aid Dashboard' link under the Financial Aid option in your self-service menu. View your award Letter and complete the Entrance Counseling and the Direct Student Loan Master Promissory Note if you wish to use the Federal Direct Student Loan program by going to www.studentloans.gov. Use the 'Estimating Remaining Costs Per Term' calculator on your Award Notification to determine if additional funds will be needed.